Cooking them is a long process and it takes hours to soften the little meat that surrounds the bones. Locals don’t waste food and cook almost everything. There is even a Chinese saying that "anything that has four legs and is not a table can be eaten". Don’t worry, Chinese people don’t drink the blood. 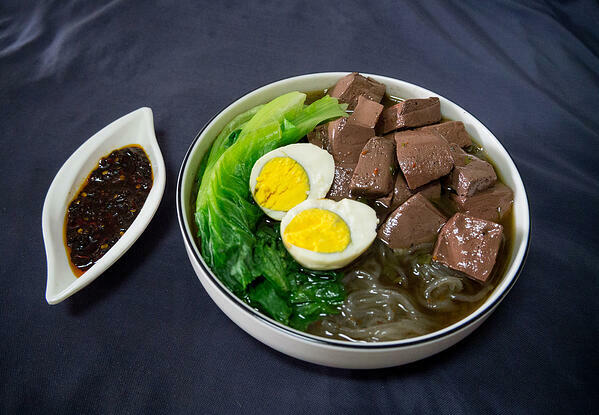 Duck blood, 鸭血 yāxuě in Chinese, is basically cubes of clotted duck blood and is usually cooked in a spicy soup. You can find it in every hotpot restaurant. Duck blood is really tasty and is also known for its health benefits. If you go to China, you should definitely try it, it is ‘bloody’ good! Let's talk about Taiwan and its stinky tofu. Although its name is not appealing, it clearly defines what to expect when you smell it: it stinks. If you go to Taiwan, you don't have to look for a place that sells stinky tofu. Just visit the famous night markets and wait for the strong smell to come to your nose. It doesn't seem appetising, but like French cheese, the taste is just amazing. 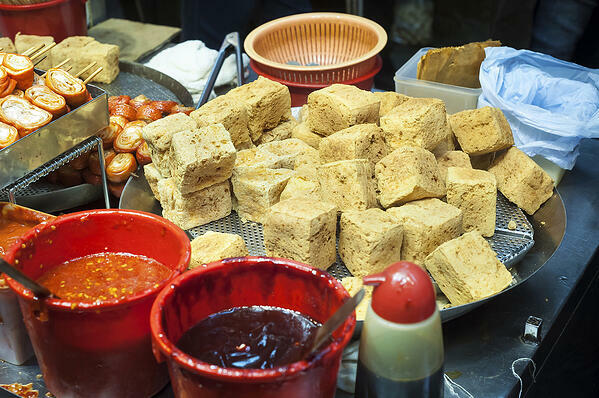 Stinky tofu is a fermented tofu with a potent smell (and a strong taste). Stinky tofu (臭豆腐 chòu dòufu) mixed with duck blood in a spicy soup is the best. 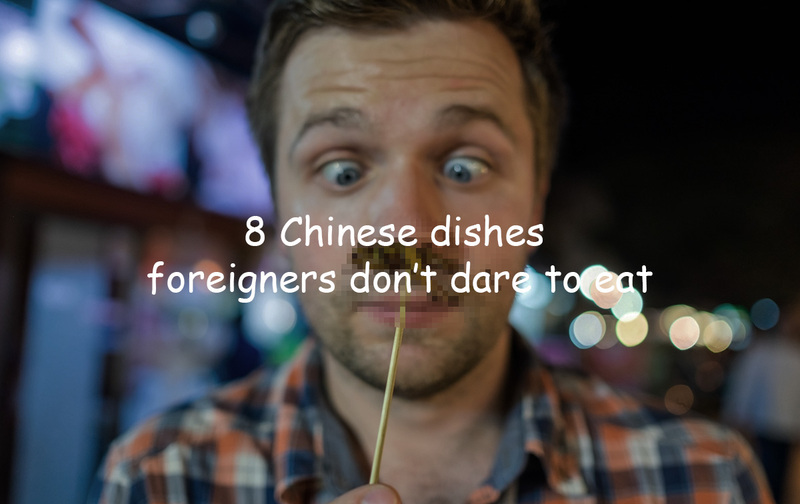 As we said before, Chinese people don't like wasting food, so intestines should be eaten too. If you go to a hot pot restaurant, it is really easy to find duck intestines (鸭肠 yācháng) or pork intestines (猪肠 zhūchàng). In Beijing, you can even eat it for breakfast. 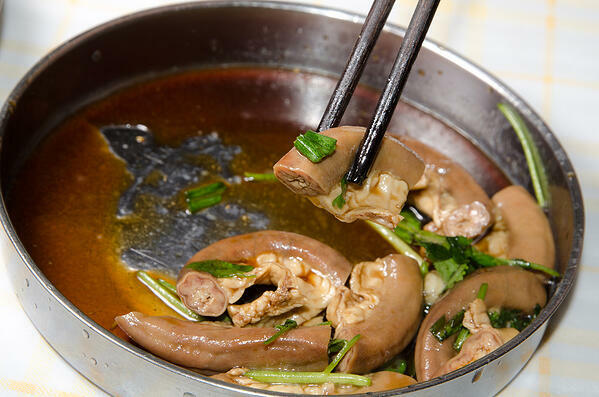 Pork or duck intestines can sound weird, but they are really tasty, and Chinese people know how to cook it perfectly. 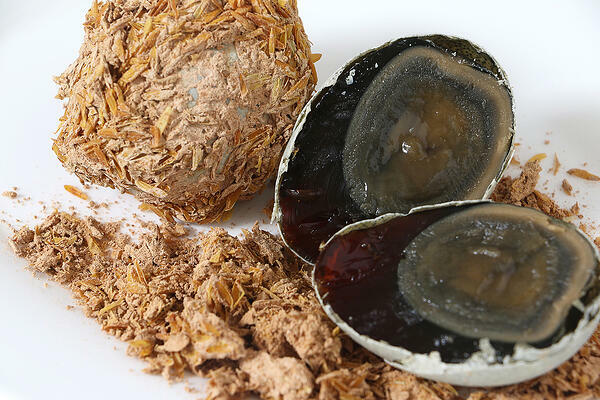 In China, the century egg (皮蛋 pídàn) is a well-known culinary specialty that consists of macerating eggs for several weeks. Result? An egg with a dark green yolk and the egg ‘white’ which has turned translucent brown. In regards to the taste, it is similar to hard-boiled eggs, but has a very strong sulphur smell. In some western countries, we like eating chips or peanuts as appetizers. In China, they prefer pig's ears (猪耳朵 zhū ěrduo). Pig's ears can be first boiled or stewed, sliced thin, and then served with soy sauce or spiced with chili paste. 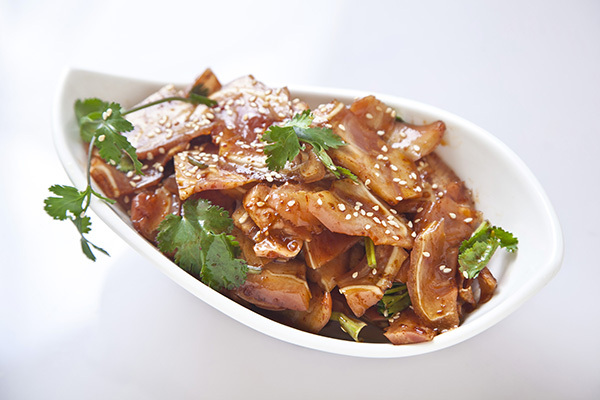 China has a lot of popular side dishes, and pig's ears are one of them. If you go to China, you should definitely try it. Considered a refined dish in Hong Kong, snake soup (蛇肉汤 shéròu tāng) is believed to ensure longevity. Cooked in boiling water, snake meat then looks strangely like chicken (and tastes a little bit like it too). It is mostly common in Hongkong, but you can also find some places that sell snake soup in mainland China or Taiwan. Grilled pig's brain (烤脑花 kǎo nǎohuā) can sound really gross and not appetising at all, but once again, Chinese people really know how to make it taste good. 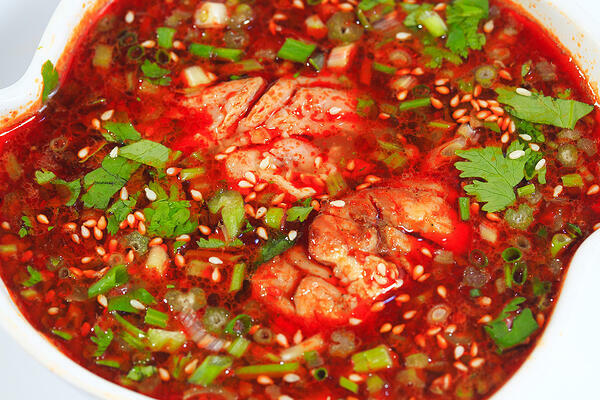 The grilled pig's brain is a traditional snack in the Sichuan-Yunnan region. 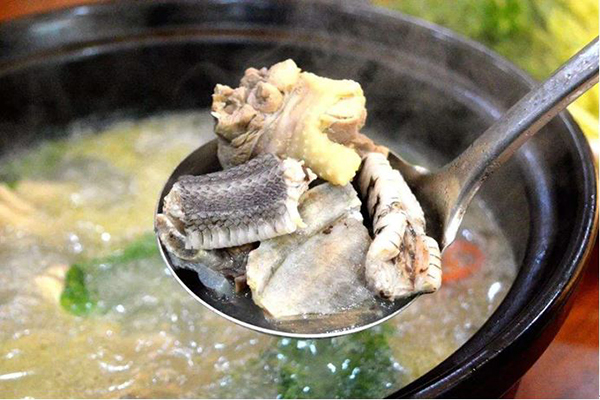 It is prepared by mixing the pig's brain with sea pepper, pepper powder and other condiments. It is very soft and smells really good. When eating a bite, the brain melts in your mouth and offers a delicious spicy taste. 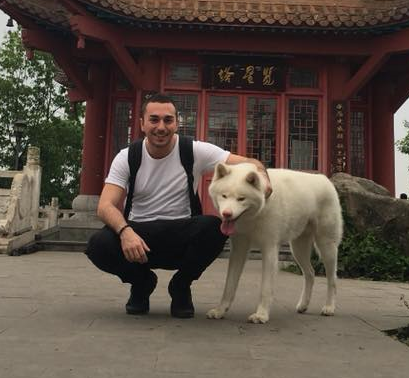 If you have the chance to visit Chengdu, Chongqing, or the beautiful province of Yunnan, don't hesitate to ask your local friends to bring you to a restaurant that sells it. 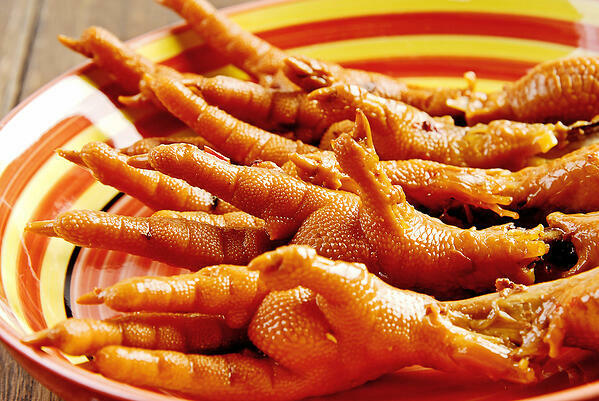 Chinese and Western cultures are extremely different, and so is the food. Thus, we may be surprised and reluctant when visiting China for the first time. However, it is important to be open-minded and at least try some of these dishes when eating with local people. You may be surprised by how good it tastes.